This is the second instalment of my look at the four Drexciya oddities not exclusive to one of their own releases. The first one was their production help on ‘Wardance’ by The Martian and the last will be their contribution to the Interstellar Fugitives compilation which I hope to get to soon but it did take me almost four months to write this follow up! 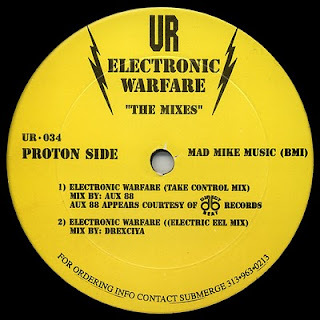 UR's 'Electronic Warfare' "The Mixes" was released on 12" on Underground Resistance in 1996. By this time Drexciya were well known Underground Resistance recording artists and it would have been no surprise that they would have been asked to do this one and also no surprise that they would never do one again being the contrary types they were. Later the same year they themselves would release their 'The Return of Drexciya' 12", just 3 catalogue numbers later on UR 37. Alongside the original and one alternate take from UR themselves on one side and the very well known 'Take Control Mix' by Aux 88, Drexciya delivered their first and only remix on what they call the Proton Side. Maybe not surprisingly their 'Electric Eel Mix' barely uses any elements of the original. Perhaps only in the first few seconds does it acknowledge it origins with a very slowed down and reverb filled "Do not allow yourself to be programmed." , sampled from the original. So basically they have done their own track here, which is good. This scary sounding intro soon gives way to a real loose and fun track, kind of almost a weird party track. Loads of strange sounds buzz and ricochet in and out of the mix throughout and you can really tell this was done live and it does sound like a lot of fun was had. A low tempo jaunty bass line keeps it together alongside a fairly sparse drum programme with everything else sprinkled on top. There are a lot of underwater type effects used which you can appreciate more on headphones. There is a vocal which I'm not sure if it was done just for this or if it was itself sampled from one of the other tracks from the original 'Electronic Warfare' double 12", I only have record 1 of the original set, (don't ask!). But it is saying over and over again, "No Programming." The speaker doesn't sound like any of the many voices we've heard from Drexciya or Gerald Donald over the years but it is filtered and may have been slowed down too. Towards the end it gets a bit more manic as more and more strange sounds are thrown into the pot to stew. Regarding the choice of electric eel for the remix title I'm guessing they just connected it with electricity and their usual aquatic theme. Not much more to say about it, no hidden messages which I can find this time. But it strikes me that if anyone would be interested and have the time to break down each UR record in order of release similar to what I’ve done with Drexciya they would have a very interesting project to get their teeth into. If I could clone myself and had their entire catalogue I might just do it. UR have taken a long strange journey and in my opinion there are loads of subtle layers of meaning with them which have yet to be widely discovered and while we are on the subject, although I think I have mentioned this before, Jeff Mills is also an obvious candidate for an in depth examination. How easy is it to find this record these days is an obvious question. Well, on Discogs there are currently 21 for sale from about $10 and up. It is definitely out of press as well but it did appear on DJ Rolando’s Vibrations mix from 2002 on Underground Resistance. The track has yet to turn up on YouTube. 'davey Jones Locker' from 'True People: the Detroit Techno album' will be next. This just up on the Zerkalo website, tonight's show in Paris will be streamed live, details here. 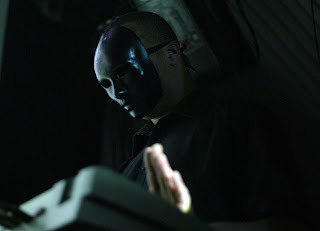 Zerkalo played a very powerful and professional six track set during the interval of headliner Christophe. It can be viewed at the Arte link below from 63.10sec on. Victoria Lukas was sporting a fetching new bob type haircut for the occasion. Go straight to show here. 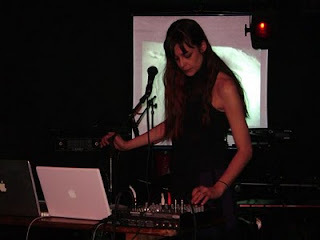 Also I see that a new live video clip of Zerkalo in Paris in January 2010 has been posted by a fan. DJ Stingray is interviewed in the current issue of The Wire. It is by Derek Walmsley who also did the Dopplereffekt one. In it he mentions that James Stinson gave him his DJ name and also that he knew Drexciya right back in the day, when Donald's Glass Domain 12" came out. Dopplereffekt are advertised as playing at the 'Off-Centre' festival in the famous Melkweg venue in Amsterdam from 26th - 29th May 2010. Saw Surgeon here once back in the day. There's a whole host of unreleased live Dopplereffekt tracks, probably from soundboard as no audience noise, for you on these two videos. Dopplereffekt's 'Infophysix' with visuals from 'A is for Atom' (1953). The suitably sinister 'Lab Rat 3' by Lab Rat XL for this Disney short 'Our Friend the Atom' (1953). Fan video for the no longer available Zerkalo track 'Invisible' from 2008.